There’s no doubt that as an endurance athlete, nothing will take you to the next level like getting a coach. A coach will customize your training program to your needs based on where you are currently, what you want to achieve, and your unique strengths and weaknesses. A coach also adds a heightened sense of accountability. However, many of us think “a coach is not for me” for various reasons. Here are the top five reasons we hear athletes say they’re not going to hire a coach…and why you should rethink your assumptions. Many athletes perceive personal coaching as too expensive. However, there’s a wide range in the level of coaching that is available – for example, you may decide that all you need is to chat with your coach on the phone once a week, and otherwise communicate within the TrainingPeaks platform and by email. When we match athletes to coaches in our Coach Match Service, we ask you for your monthly budget and match you accordingly to a coach you can afford. The range we can search for starts at fees of less than $100/month and goes up to over $400/month based on how much of your coach’s time you’ll want. Think about it – at less than $100 a month, for the same cost of a monthly membership to many gyms, you’ll get customized guidance towards your goals. Also, let’s dig deeper into this, beyond fees. Training for sport is a practice in time management and prioritization skills. Workouts have to be fit around school, work, family, social or other obligations. A coach can help you maximize your time, making sure you use it most efficiently. An effective training program is not just about logging hours and miles. If you structure your training effectively, incorporating intensity in the right way, you can cut your volume down and actually get faster. When you’re training, you invest time away from important life priorities – a coach will help make sure it’s time well spent. It’s too expensive NOT to have a coach. Coaching is not just for pros and elites. According to USAT’s 2012 membership breakdown, one of the fastest growing groups in triathlon are age groupers, aged 30-49. These athletes are hiring coaches. Many coaches specialize in beginner or more recreational athletes. It’s a matter of finding the right coach who will work with your background, your ability, and your goals for the future. Further, you may not think of yourself as a “serious enough athlete” right now, but that could change with targeted training and expert feedback – which only a coach can provide. 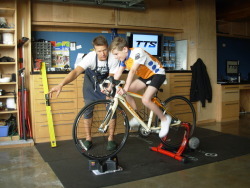 We can tell you that 1 out of 4 athletes that use TrainingPeaks are coached. They are athletes of varying levels of experience, but what they all have in common is that they are serious about RESULTS. If you are too, you should consider getting a coach. Having a coach is a personal relationship. It’s important to interview a few coaches and find the one that is the best fit for you. A good coach will work around your schedule and your life commitments. The right coach will work with you to maximize the time you do have towards your training and racing. We know that finding the right coach can sometimes seem like a daunting task, and not everyone has a wide network of friends and family who can make recommendations. Our Coach Match Service is designed to solve that problem for you. After you answer a questionnaire about your needs, experience level, budget and goals; we will match you with three of our hundreds of TrainingPeaks Accredited coaches. You can interview each coach and find the one who best matches what you are looking for. And the best part, it’s free! You can also use our Coach Directory to start your search, browsing all 3,000 coaches who use the TrainingPeaks platform to deliver their expert advice. Our Coach Directory will help you find coaches who are in your area – check it out here. True, you can. Many athletes attain their goals through self-coaching or following a training plan. But can those goals be set higher when working with a coach? What happens if you get injured or sick? A plan doesn’t know that you’ve had the flu for one week, or that your kids have been sick and out of school. A coach’s job is to work around those things that come up. Try our free Coach Match Service. You’ll answer our questionnaire, and we’ll find you three coaches that fit your needs who have gone through our TrainingPeaks accreditation process (and are also certified by governing bodies such as USAT, USAC, British Cycling, etc). Or, take on the search yourself using our Coach Directory, which lists over 3,000 coaches around the world. Whichever approach you take towards finding a coach, you’ll also be taking a big step toward achieving or even surpassing your fitness and personal goals. Melissa Schwartz leads the Education Department at TrainingPeaks. In her 3.5 years with the company, Melissa has specialized in educating and supporting endurance sports professionals who use the TrainingPeaks Coach Edition product. She is a former All-American swimmer and water polo player, and now spends her athletic time doing triathlon, running marathons, and harboring a secret love affair with golf. She's also a USAT certified coach and enjoys helping fellow moms see their athletic potential. Follow Melissa on Twitter.